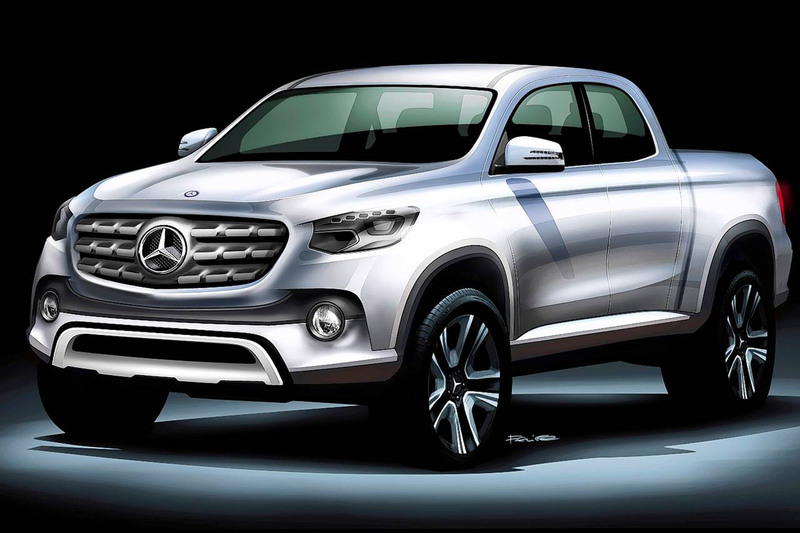 Mercedes-Benz will launch a midsize pickup before the end of the decade but perhaps in 2017. 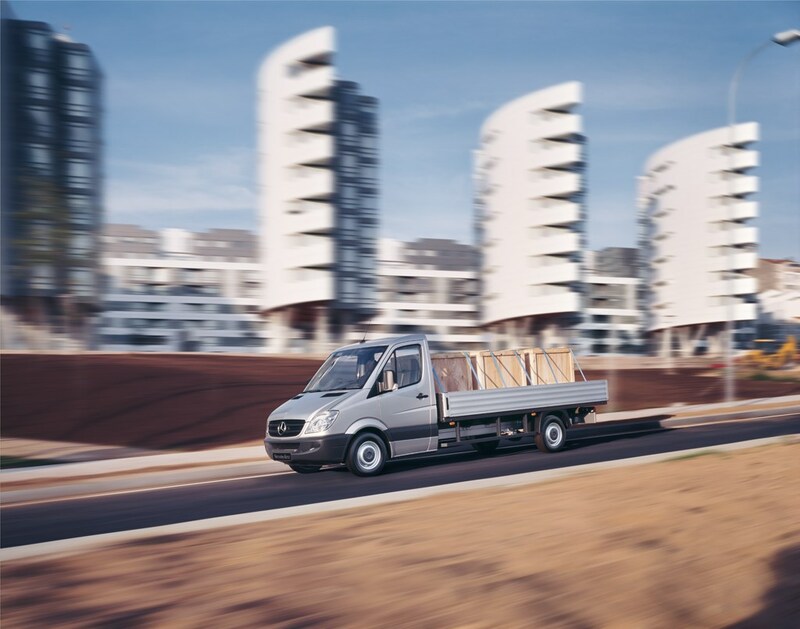 The new Mercedes-Benz pickup will initially be targeted at markets in South Africa, Latin America, Australia, and Europe – all of which are posting sustained growth in this segment. It is expected to be a bakkie version of the V-Class and the Vito models and will be developed by the same team. It appears it will be more consumer orientated than workhorse. More like an Amarok, less like a Land Cruiser. Styling exercise for the proposed new Mercedes-Benz bakkie. The existing Mercedes Sprinter bakkie. 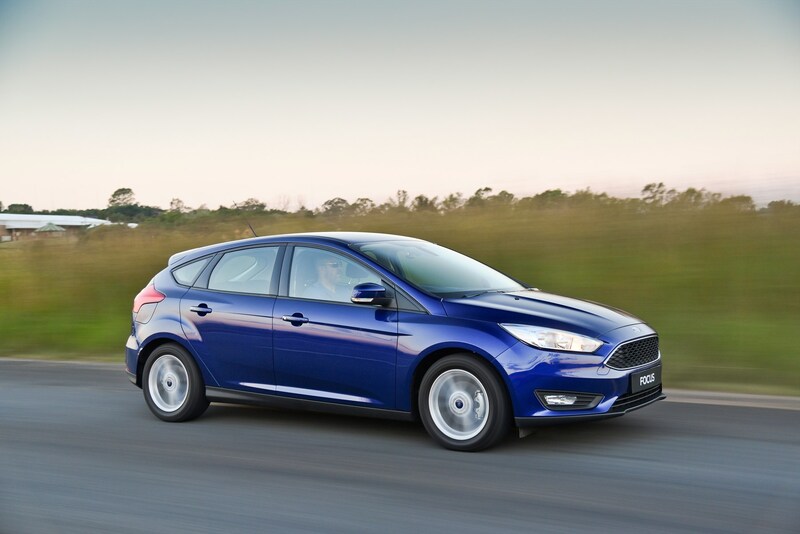 The new Ford Focus is on its way. Available in four and five-door guises, and in the new exterior colour Deep Impact Blue, the new Focus has a lower, wider stance, with a new bonnet, front fascia and grille. 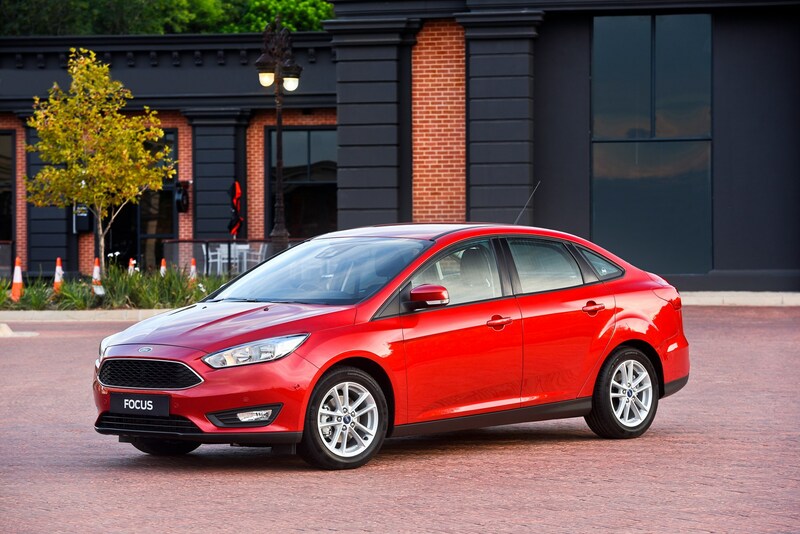 The Focus comes with either the 1.0 EcoBoost or the new 1.5-litre EcoBoost petrol engines. The new Focus is also offered with Ford’s new fuel-efficient 1.5-litre EcoBoost petrol engine that delivers 132kW of power and 240 Nm of torque. 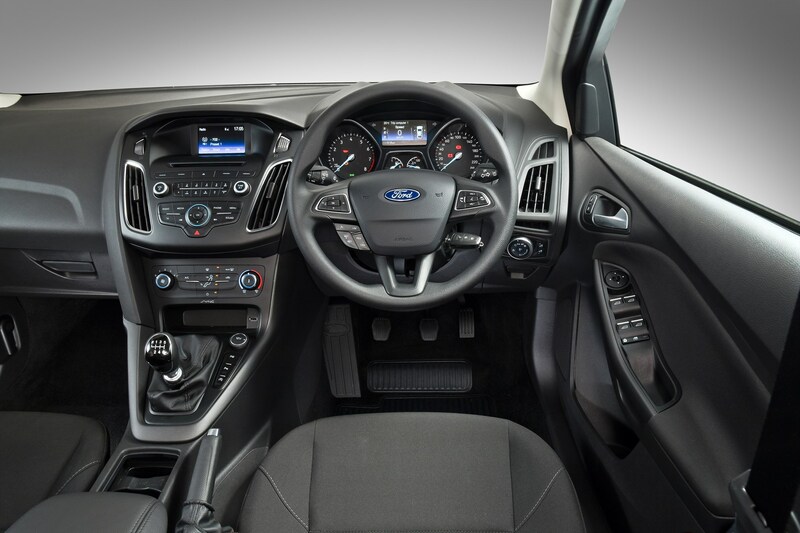 Both EcoBoost engines use a six-speed manual transmission. A six-speed SelectShift Automatic will be available on the 1.5 EcoBoost models later this year. Park-Out Assist helps drivers as they exit a parallel parking space. After the driver has chosen either the left or right hand side the system operates the steering while the driver operates the accelerator and brake. Ford also has improved its Active City Stop collision avoidance system, which uses sensors at the front of the vehicle to look for stationary objects in the road ahead and pre-charges the brakes if the vehicle is approaching an object too quickly. If the driver still does not respond the system reduces engine torque and automatically applies the brakes to reduce the impact of collisions. Active City Stop now operates for the new Focus at speeds of up to 50 km/h, increased from 30 km/h. Ford has now ramped up capacity worldwide to build the car in eight plants on four continents. Factories in Germany, US, Russia, China, Thailand, Vietnam, Taiwan and Argentina have a combined capacity to produce more than 1.5 million Focus vehicles annually. This car feels sooo good to drive. You can be cruising along placidly at 110km/h wafting pleasantly to your destination, but when you decide to get going the V6 snarls, you are shoved firmly into the seat and you leave the traffic in your dust. Lovely stuff. Not only does it perform exactly as required but she looks stunning. I can’t tell you the number of times I saw people stop and stare, and then smile. There are some who complain that this new Accord is too American, but I think Honda was right to bring in the slightly bigger US version to replace the previous European model. The Civic has grown substantially and easily takes on the 3 series BMW so the Accord has to match the 5 series, E-class executive sedans from Germany. The Accord will now compete at the top end of the mid-size executive segment says Graham Eagle, of Honda. I agree. I found it very roomy, with serious leg room at the back and a huge, deep boot. You could easily fit 5 golfers in the cabin and their golf bags in the boot. 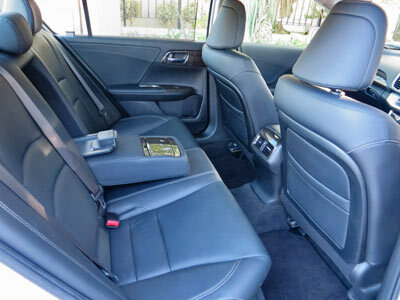 The front seats are 8-way electrically adjustable and very comfortable. There are two memory settings for the driver’s seat. For longer items a porthole above the rear centre armrest (which has cup holders) opens to the boot. The steering wheel is a joy to use. On the right are the cruise control, braking distance and lane monitor controls. On the left audio, bluetooth, telephone and menu controls. 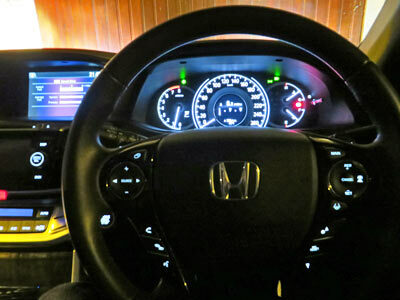 While the Accord will waft you along cocooned in comfort and safety it is fun to drive in the Honda tradition. Performance and handling is superb, not to mention exemplary raodholding. This remains very much a driver’s car but without the harshness (sportiness) of some of its Teutonic competitors. I loved the left side blind spot camera. 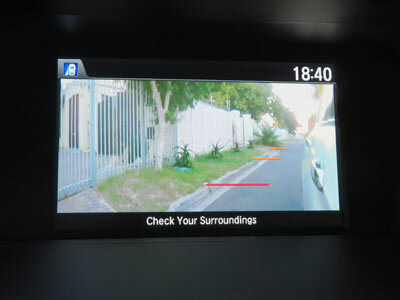 When you turn left, or indicate left a camera built into the left-hand mirror shows you what is happening on that side of the car in the multifunction screen. The display includes graduated lines which help you judge the distance and speed of the car in the left lane. One of the many extra little touches is a sun screen for the rear window which you can raise and lower with the push of a button. The active safety features included as standard on this car are astounding. From the now mundane ABS brakes to adaptive cruise control, motion adaptive power steering, lane keeping, automatic wipers and headlights and so on, fifteen of them in fact. These exclude the passive safety measures like six airbags, fancy seatbelts, active head restraints and so forth. With 207kW and 339Nm on tap and a max of 200km/h do not expect awesome fuel consumption figures. You will however get a not too bad 9 litres / 100km in general use and around 7L/100km on the highway. Its a V6… the sound and the acceleration is worth the small premium at the pump. I got 8.1 litres/ 100km on my usual route, which includes town, highway and a ten storey parking garage, which is good for this size car. Price as tested R576 300. The range starts with the very competent 2.0 Elegance R408 400 and includes the 2.4 Executive at R471 300. The Accord comes with everything but the software for the GPS installed. Standard features include headlamp washer, sunroof, automated headlights and wipers, rear view camera, lane watch camera, tyre deflation warning, LED day running lights, adaptive cruise control as well as climate control, and a good sound system with USB and aux connection points. My wife says the German “Mercedesy” look on the outside with an American look on the inside might seem strange at first glance, but the layout of the control area is clean, clear and very practical. So…ignore the fake walnut not-so-nice finishing touches on the dash and rather keep your eye on the road and the admiring smiles of passers-by. The Germans have a way of fooling the public concerning price. 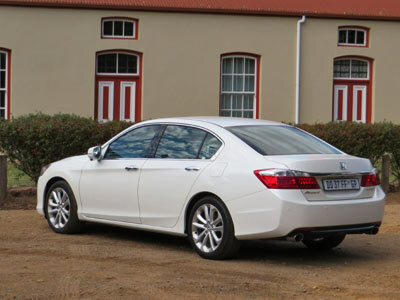 The V6 Honda Accord is R25 000 cheaper than a BMW520i. Performance wise, it competes with the R80 000 more expensive 528i. 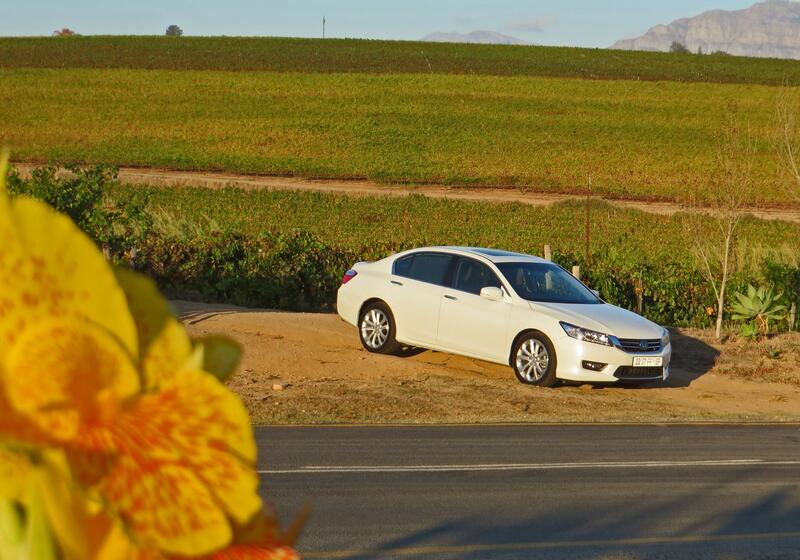 The Accord has as standard “extras” which will cost about R120 000 on a German car. Remember when it is time to trade-in, the price is based on the standard list price. So the equivalent (with goodies included) Audi, BMW or Merc costs between R150 000 and R200 000 more than the Accord. Making the Accord a bargain. Add to this the knowledge the Accord is probably better built and it becomes a no-brainer. The Mercedes E250 is R673 000 without extras but offers fuel consumption around 8L/100km which is almost 1 litre/100km better. BMW 5 series 528i is R723 000 without extras, also around 8L/100km. Audi 2.0T A6 is R581 ooo excluding most extras and is a 4 cylinder. No wonder this car was a 2015 SAGMJ COTY finalist. 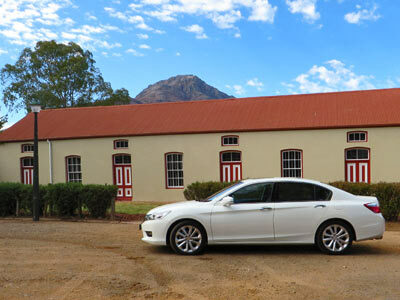 In a nutshell the Honda Accord 3.5 V6 is great value, spacious and worry-free luxury transport. The warranty is for 3 years or 100 000km and you get a service plan for 5 years or 100 000km included in the price.